Additional D810 Information. How big is the buffer? Read the article on dslrbodies. Another One Bites the Dust. (Updated) Maybe. Comments about Aperture’s rumored demise. Article on dslrbodies.com. Fujifilm Firmware Updates. Updates for the X-Pro1, X-E1, X-E2, X-T1, X-A1, and X-M1 cameras. Article on sansmirror.com. More on the D810 announcement. One thing that was clear in the press materials is that someone new is writing the press releases. While they follow the usual lead, quote, details formula that most Nikon press releases follow, the wording was very different. Article on dslrbodies. Yesterday’s article on announcement. Nikon Tweaks the D800, Creates D810. Nikon today announced a modest update to the D800/D800E cameras, the D810. Article on dslrbodies. Camera data page. Something Completely Different: Canon 1Dx. Last weekend I shot the Arena Grand Prix swim meet in Santa Clara, an Oakland A’s versus Boston Red Sox baseball game, and a field hockey game. And I shot most of the three events with a Canon 1Dx. Article on dslrbodies.com. I’d Prefer Not to Believe This. 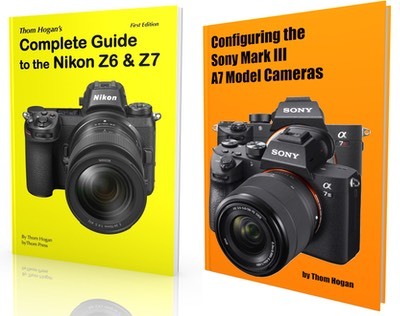 Nikon has posted a series of translated Q&A’s from their Medium Term Management Plan of last week. Article on dslrbodies.com. Virtualize if you Can. Yesterday I mentioned that I thought that Capture NX2 would break with the upcoming Apple Mac OS-X Yosemite release (fall 2014). Article on dslrbodies.com. Clearing the Adobe Cloud. With the monolithic update Adobe did last week to the Creative Cloud applications, I’m getting a lot of questions about what happened and what they should do. Article on dslrbodies.com. New Tamron Lens Announced. The 28-300mm got a diet and slimmed down, all while getting a faster focus motor. Article on dslrbodies.com. Lens data page. Tamron Finally Releases 14-150mm for m4/3. It took one-and-a-half years to take out the VC and ship the lens, but it finally has arrived. Article on sansmirror.com. Lens data page. Dr. Nikon in the House (Eventually). Today’s Wall Street Journal has an article (note: fire-walled site) that gives us more insight into what Nikon was talking about at their annual shareholder’s meeting and subsequent press interviews. Article on dslrbodies.com. Everything Old is…well, Still Old on My Computer. Adobe promoted today’s announcements under the line Everything Old is New Again. Article on dslrbodies.com. Olympus E-M1 Review. The E-M1 is the second camera in the OM-D lineup. First came the E-M5, then the E-M1, and after that we got the E-M10. If you’re trying to make sense of that naming scheme, a lower number is a better camera, a higher number is a less specified camera in some way. Still, they’re all recognizably made from the same camera platform and share a lot of features. Article on sansmirror.com. Canon EOS-M Limps into Telephoto. In Japan Canon today announced the 55-200mm f/4.5-6.3 IS STM lens for the EOS M mount, finally bringing a native telephoto lens to the system and growing the lens offerings to a whopping four. Article on sansmirror.com. Lens database page. Fujifilm Announces 18-135mm. The 18-135mm is the first lens to match the weather-proof sealing of the X-T1 camera. Article on sansmirror.com. Database page for lens. 1” Is the New Bottom. Panasonic today announced the FZ-1000, their response to the Sony RX-10. Article on gearophile.com. Aptina Imaging Sold. ON Semiconductor has begun the process of acquiring Aptina Imaging for a reported US$400 million. Article on dslrbodies.com. Nikon Stops Neglecting the Coolpix A. The Coolpix A got a firmware update to version 1.11. Article on dslrbodies.com. The “Good Enough” Problem. I think everyone gets the fact that smartphones have basically killed a whole range of compact cameras from camera makers because they’re “good enough” for the types of casual photography that those products were used for. But there’s more to it than that. Article on dslrbodies.com. Focus Focus Focus. We’re nearing the “good enough” stage for mirrorless focus. But “good enough” is not necessarily “DSLR level.” Article on sansmirror.com. Fujifilm X-T1 Review. The Fujifilm X-T1 is the sixth in the series of X cameras Fujifilm has produced, so you’d expect that with all those predecessors that it would be refined. Article on sansmirror.com. D300s Says First Goodbye. NikonUSA has moved the D300s DSLR from the active camera list to the archived camera list. Article on dslrbodies.com. Basic Camera Would Sell Big. If you weren’t lying when you filled out my survey, my site would have sold over a million dollars worth of gear in less than two hours. Article on dslrbodies.com. Back to the Basics Experiment. I’m going to define some products that don’t exist. Afterwards, take a survey. Article on dslrbodies.com. Mirrorless Growing Again. Doing a year-to-year comparison of the first four months from CIPA numbers, we find: Article on sansmirror.com. Nikon Not-Really Deals. Yesterday I noted on sansmirror.com that the mirrorless camera and lens deals were cranking up, most notably the buy one and get one free sale from Zeiss for their E-mount and X-mount twins. Nikon’s current deals? Meh. Article on dslrbodies.com. Deals Are Ramping Back Up. We’re coming up into the second biggest purchase season for cameras (Father’s Day/Graduation plus purchasing for summer vacations), and inventories are still high and slow moving virtually across the board here in the US. That means that deals can’t be far behind. Article on sansmirror.com. Nikon D3300 Review. The D3300 is an important product in Nikon’s lineup because it represents the entry point for the DSLRs, which are Nikon’s most successful and profitable cameras. Article on dslrbodies.com. iCloud Photos. At today’s annual developer conference Apple gave a very small preview of where they’re going with photo handling, both for iOS and OS-X. Article on dslrbodies.com.